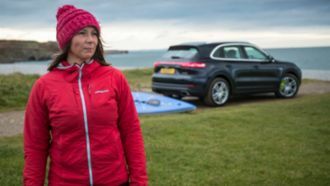 On the road with eco-warrior Sian Sykes and a Cayenne E-Hybrid at the shoreline of Wales. Porsche is moving towards a "Zero Impact Factory" with a special facade in Zuffenhausen. The Management Board of Porsche AG has now decided to donate a further €10 million. Porsche is opening its third “Training and Recruitment Centre” in the Mexican town of Puebla. 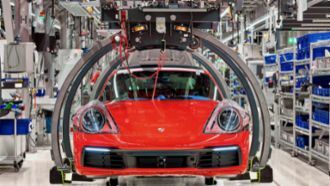 Porsche has commissioned a fully electric MAN eTGM for logistics at its Stuttgart-Zuffenhausen site. Porsche Leipzig has harvested its first honey of the season, with approximately 1.4 tonnes. Porsche is introducing another 1.5 million honey bees to the factory's off-road site in Leipzig. Porsche is getting on board the “green train”, laying the tracks for sustainable and responsible activities. The honey bees at Porsche Leipzig have produced 400 kilograms of lime blossom honey. Porsche is getting involved in nature and species conservation work at its site in Leipzig.